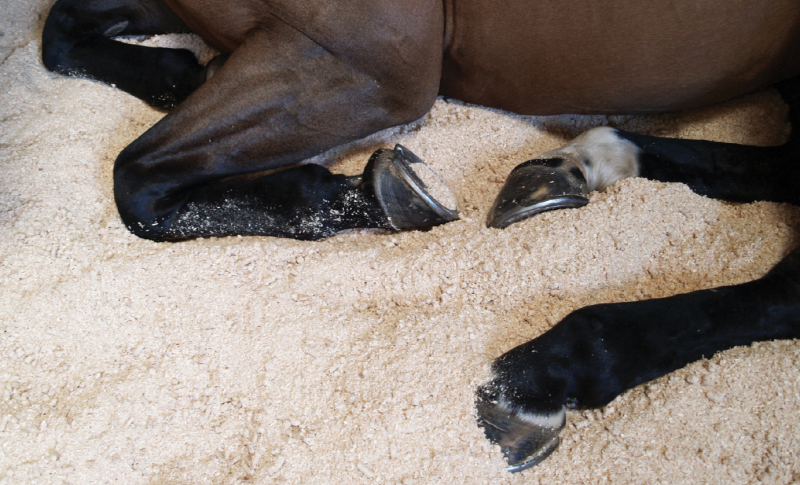 Sorbeo is a super absorbent wood pellet based horse bedding that provides a high quality and cost effective bed. Our pellets are made in Scotland and we deliver direct to your stable door. Sorbeo is easy to use, virtually dust free and easy-to-clean. Any moisture produced by your horse is easily absorbed by Sorbeo making your job a whole lot easier – mucking out becomes less of a chore. Sorbeo is a completely natural product offering a real alternative to the more traditional forms of horse bedding including wood shavings, straw, paper and cardboard. Sorbeo is made from environmentally sound wood pellets, made at our very own pellet plant in Scotland. This gives us total quality control – we know where the wood comes from and how the pellets are made. With a wealth of experience and knowledge in this market, we understand that you need a product that you can rely on. Sorbeo won’t let you or your horses down. Why is sorbeo better than other bedding? Sorbeo is made from virgin spruce pine soft wood from sustainable Scottish forests. Our wood is slowly roasted over a few days using our own biomass boilers which extracts every milligram of moisture from the finished pellets. This unique process retains the colour of the bedding and improves its overall absorbency. You will find that more moisture is absorbed over a longer period of time making sorbeo the ultimate wood pellet bedding. What makes sorbeo different to other beds? Sorbeo saves time, money and muscle power – with or without rubber stable mats. Sorbeo is easily stored and managed in confined spaces – each 1m x 1.2m pallet is stacked with 55 x 18kg bags. And Sorbeo’s special absorbent qualities cuts dust and waste to a minimum and we deliver pallets direct to your stable door for just £310 (price includes delivery to mainland UK and VAT) or half a pallet for £185. 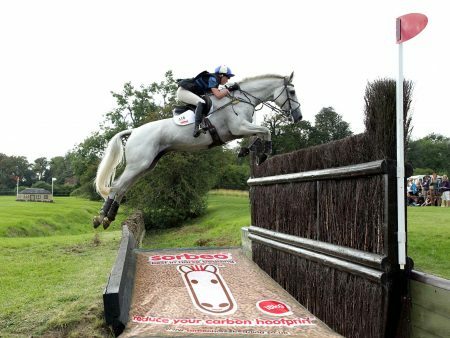 Sorbeo is made from 100% Spruce Pine soft wood which is naturally antiseptic and is great for horses and ponies with any foot problems from mudfever to laminitis. It even smells pine fresh! How do I use sorbeo? People use Sorbeo in many different ways. Water is added to the bag which fluffs up the pellets into a lovely dense, dry bedding. As you begin to use Sorbeo you will quickly work out how much water you prefer to add to each bag. Our Sorbeo fans with very wet horses sometimes top up their beds with dry pellets on top of the wet areas. Some add half the amount of water to begin with and as their horse walks in the stable the bedding mixes with the bedding underneath. Others pre-soak the bedding completely and change it everyday. You can even maintain a deep bed if you prefer, with banks as you would with shavings. Sorbeo is so versatile it will work the way you want it to. If you would like more help or advice please call us on 01466 700367. Sorbeo is more absorbent than other pellet bedding due to our unique manufacturing process and by the use of raw spruce pine. We boast an absorbancy ratio of 350ml to 100g of bedding – that’s a whopping 3.5:1 – three and a half times its volume! A bed of shavings is 182ml to 100g and normal pellet bedding just 270ml to 100g. What sort of floor do I need to use sorbeo? Sorbeo works well on all types of flooring: rubber mats, concrete or natural. And it can be used for shallow or deep beds. Do I have to add water to start a sorbeo bed? We recommend that you do. If you use sorbeo straight from the bag you won’t have a fluffy, comfortable bed… and the pellets can be quite slippery if they are not ‘activated’ with water. You will quickly work out how much water suits you and your horse. Once the fresh bed has been made many sorbeo users like to top it up with dry sorbeo especially in very wet areas – it is very good for a particularly wet horse. Why is sorbeo good for laminitic ponies? Why is sorbeo better than straw? Straw harbours dangerous micro-sized dust particles that you cannot see. These tiny dust pieces can be inhaled deep into the lungs of your horse and can contribute to respiratory ailments. Sorbeo does not carry these dust particles. Why is sorbeo so time-saving? Unlike straw, dry, useable bedding naturally falls through the tines of the fork to the floor – no waste, less effort. Try it. It takes just minutes to muck out a bed of sorbeo. Your muck heap will be tiny compared to a piled-high straw midden. Do I have to soak my top up bags? Not always. If you have a really wet horse , you could add dry pellets to the wet area of your stable. How do I order sorbeo? You can order your sorbeo here online or by telephoning 01466 700367 using your credit card. If you prefer to pay BACs then we can arrange this too. We will usually get your pallet to you within 3 working days – often less. How will my sorbeo be delivered? We recommend that your yard has good access. Most local delivery depots have 7.5 tonne lorries available (normal horsebox size). Our delivery lorries have a tail-lift and a pallet trolley so that your pallet can be moved into position. The delivery spot will need to be flat and free from gravel. A full pallet is 1m x 1.2m x 1.6m high. If you have any concerns regarding delivery, please see our delivery pdf. If you need a small lorry please specify this on ordering. You will be able to add any specific delivery instructions on the ‘buy me‘ page. 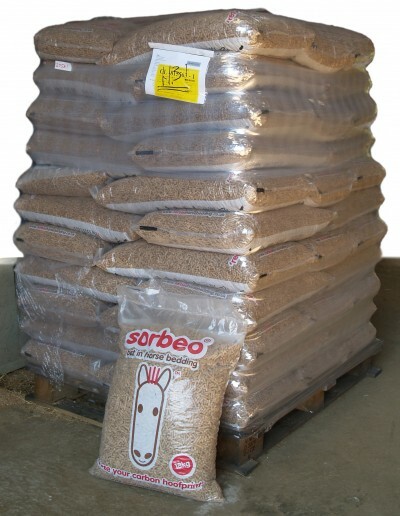 Sorbeo is a horse bedding therefore our price includes 20 per cent VAT. Companies who offer you 5 per cent VAT option on their pellets which are for use as horse bedding are breaking the law. There are lots of wood pellet companies around - why is sorbeo the best? Like flour, sugar and milk, wood pellets are a commodity and, to some people, a wood pellet is a wood pellet no matter where it comes from or whatever it is made out of. Cheap European imports have been flooding the market and are now available in the UK. These are mainly used for the energy market so will be subject to just 5 per cent VAT. Knowing the source of your wood pellet bed is increasingly important. Cheap imports can be made from just compressed sawdust which makes the pellet bedding highly dusty once it’s broken down. And some pellets are manufactured using extremely high temperatures making the finished pellet brittle. What makes sorbeo so cost effective? Sorbeo creates very little waste and saves time. It takes 3-5 minutes to muck out a Sorbeo stable leaving you time to get to work or do one of the other million jobs you have to juggle on a day-to-day basis. And you don’t even have to pick it up – we deliver to your stable door. How do I buy sorbeo? 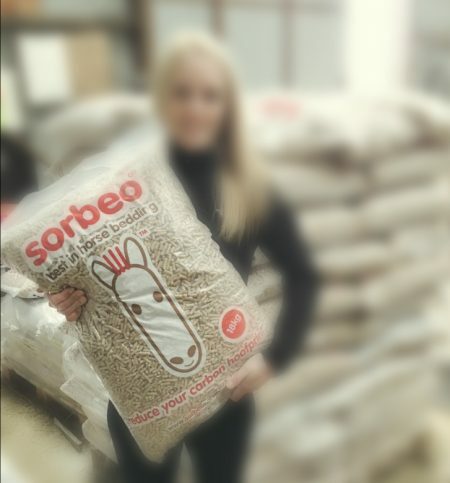 We deliver sorbeo in manageable 18kg bags – 55 bags to a pallet – giving you 990kg of sorbeo which should be enough for one horse for a whole year. Just call 01465 716025 or 01466 700367 or email sales@sorbeohorsebedding.co.uk. We will arrange delivery direct to your yard within a few days. How does sorbeo reduce my carbon hoofprint? ...and is it sustainable? Each 55kg bag of sorbeo is crammed with perfect little sorbeo pellets… They were once a mighty Spruce Pine – felled in a sustainable Scottish Forest. Trees that come into our plant only come from certified forests and every tree we take away is replaced with seedlings that replenish the forest. The trees are chopped into logs and taken to our nearby factory in Ayrshire. Within hours, our logs are ground through a mill, powered by our biomass boilers using energy pellets that we produce. This is a highly efficient combined heat and power system. (By the way, our electricity is made from the bark that we peel away from the logs before the whole process begins.) The super soft wood is milled to a fine grain to make it mega absorbent. The wood is then dried using the same biomass boilers. While the wood is hot, it is squashed tightly and the original resin binds it together to make the marvellous sorbeo pellets which fluff up into a lovely, rich bedding. This way the natural antiseptic quality of the pine is retained. The finished little 6mm diameter pellets are 100% wood – no dust, nothing added and nothing taken away – and their high density means, ultimately, more pellets to your bag without a milligram of moisture – let your horse produce that! Why is there a shortage of pellet bedding at the moment? Recently, other suppliers have seen a big shortage in pellet bedding after an abundant supply for the past three years. This is because of the increase in demand for energy pellets with new biomass projects coming online across Europe. There are very few producers of pellet bedding in the UK so most supplies come from Europe. (Not Sorbeo – it is made at our own plant in Scotland!) Flooding in forests in Russia has prevented wood harvesting. While in Iberia, forest fires have disrupted supply chains. Some other UK domestic producers have caused this squeeze in particular in the UK heating market. The industrial wood pellet index price has increased £28/t since May 2017 and there is expected to be a tight market through 2018. The demand for European pellets for biomass heating is set to increase by 3M tonnes. And of course the Euro exchange rate is making prices increase too. Why has sorbeo increased in price? The wood pellet market is going through some turbulent times – high demand and shortage of product. This is largely due to a result of problems with European imports and other UK manufacturers. It is a Europe-wide issue – not just a local UK one. There are several factors that have affected our costs, the main one being the cost of raw wood which has gone up by 40 per cent since December 2017. Paper, building products and board markets are all being affected by this price increase. The long-term wet weather is making it difficult for large machinery to get into the forests to extract trees- the ground is simply saturated. The result: a nationwide shortage of wood. Sorbeo is at the centre of a new revolution of bedding for horses. Gone are the days of mounds of straw and shavings which are time-consuming and, these days, pretty expensive. Wood pellet bedding for horses now accounts for 20 per cent of the total bedding market in the UK and continues to grow. Since 2011, growth has increased significantly from 8 per cent. And in 2006 there were no recorded horse-owners using wood pellet bedding at all. Straw usage continues to decline as has the use of shavings. Wood pellet bedding for horses has gained from their losses. 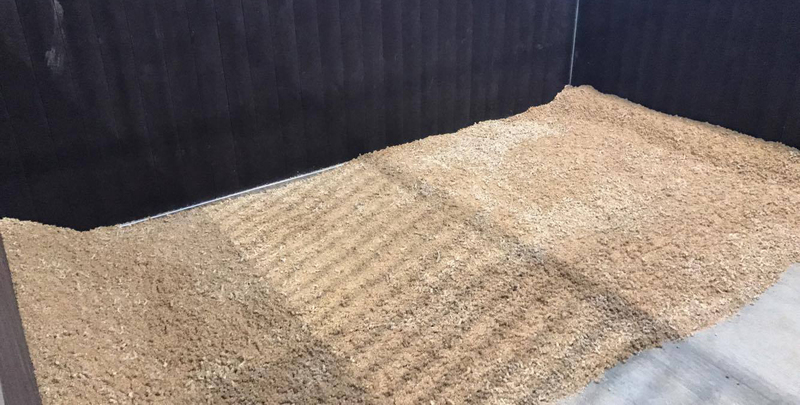 The new and popular bedding for horses on the market is Sorbeo – a wood pellet-based horse bedding which is highly absorbent, dust free, naturally antiseptic, 100% natural, extremely cost effective and environmentally sound. But Sorbeo is no ordinary wood pellet bedding. Made from spruce pine sourced within a 100-mile radius of our own factory in Ayrshire, Scotland, we pride ourselves on quality. We have discerning customers who choose Sorbeo for its consistency and reliability. Sorbeo gives them assurance and is a 5* bedding for horses. Each 18kg bag puffs up to three times its volume. And each pallet is stacked with 55 bags. Simply add a small bucket of water to each bag of Sorbeo and let your horse do the rest! Most horse owners take great pride in providing their horses with clean, nice-looking stables; some of us might even throw in that extra bit of bedding for added comfort. But could we be unknowingly harming our horses more than helping them?